Recently, obstacle racers looking to take on a 2019 race saw some new fees popping up on their registration page. Spartan has introduced a new $3.00 – $6.00 fee that has a lot of the obstacle racing community talking. This new Bag Check, Event Cancellation Insurance, and Merchandise Discounts were quietly added to the 2019 registration structure. But many athletes are wondering what does this mean? Mud Run Guide reached out to Spartan for clarification. In addition, this fee includes a Merchandise Discount that will be found in your registration packet, when you check in onsite. This may include on-site discounts, or special promotions for our online store after your race. For athletes use to carpooling this might not be much of a savings but for those who travel alone or a couple going to race this new fee can actually save your family money in the long run. While many athletes are lamenting about an additional added fee at the end of registration what this means for a season pass holder is that on average a single race will now cost you about $25.00 with taxes and fees included for those aiming for multiple trifectas this still makes a season pass worth its weight in gold. I don’t mind paying a premium price for a good race but do hate being taken advantage of. How about one simple and honest price? Along with the increase in popularity comes the inevitable increase in prices. Increase price of season pass to include a one time insurance fee to be applied to all races registered for. Make it all inclusive, spectator, bag check, all fees included. Still cant get past that a season pass still means have to pay hundreds more for fees during year. I dont think many people would mind an extra $100 if it meant there was a zero every time registering for a race with season pas. 100% agree. Stupid that you have to pay $25 every race after buying a damn season pass… makes it more a season discount. What is all the commotion about? its 3-6$! lol. You are already paying over $100 to race. 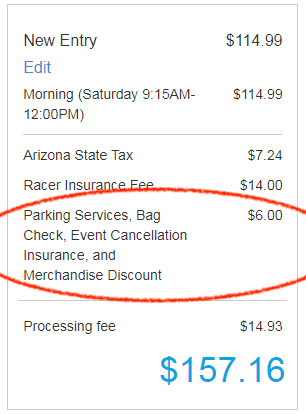 So NOW you do not need to pay $10 to park and $5 to check a bag. If you don’t check bags, then now parking is $3-6. If you don’t want a discount, than parking is still discounted. Stop being cheap.